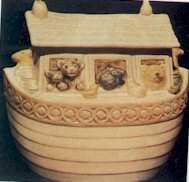 Noah's Ark Cookie Jar By Metlox Pottery. Marked "Made in Poppytrail CA". This jar has some chips and cracks on the top by the animals.